At Star Physio Perth we look after some of the best athletes in the world in a number of different sports. We are often asked by our clients “but I am not a professional athlete, can I still come to your clinic for treatment and rehab?” The answer is obviously “YES”! We are proud to offer the same service to all of our clients and the reality is that the same treatment techniques and rehab principles are applied to all of our clients. The differences are purely around the starting point, and the final goal. For example we may see the same tendon pain or overuse injury in a keen weekend gardener who has overdone things on the shovel, as we see in one of our IRONMAN World Championship (Kona) athletes who has pushed too hard while fatigued in an interval running session. How do we know what the client wants to get back to doing? We ask! How do we know where to start the treatment and rehab from? We assess! Only then can we work with you to put together the ideal treatment and rehab program for you to achieve your goals! Watch the video below to hear Star Physio’s directors discuss the common injury ITB “Friction Syndrome” and the key role that conditioning and strength training in rehab has in getting it under control. Do you want to cut your risk of injury almost in half and perform better at the same time? Do you want to reduce the risk of overuse injuries, tendon pain, joint pain and other pain in the body? Then the team at Star Physio Perth can help. The simple solution to reducing injuries in sport and in everyday life is to strengthen your muscles. A recent article in the British Journal of Sports Medicine identified strength training as the most effective way to reduce the risk of sports injuries. In fact the data suggested that conditioning and strength training can reduce overuse injuries by almost 50%. Therefore, if you are an athlete, the most effective way to reduce your injury risk is by integrating conditioning and strength training into your regime. Power sport athletes have understood this for a long time, but only recently have endurance athletes begun to understand the critical role of strength work in their overall programme. Read on to find out how conditioning and strength training can improve performance and help you run faster, ride faster, jump higher and reduce overuse injuries – or call us on 08 9212 4254 to make a booking. 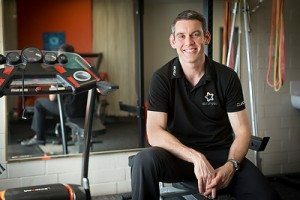 Watch our Clinical Director at Star Physio Perth Dr Merv Travers explain why endurance athletes need to do gym work to avoid overuse injuries. Dr Merv presented this lecture for Triathlon Western Australia. 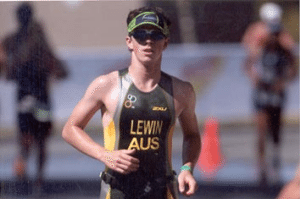 Physiotherapist and exercise physiologist James Lewin competing as a triathlete. Many endurance athletes such as cyclists, swimmers, runners and triathletes have developed their cardiovascular fitness over years of training. However, it takes more than just a good engine to really attack your PB over a given distance or to get off the bike and run efficiently. To run at your best you also need the right set of springs to carry you over the distance. 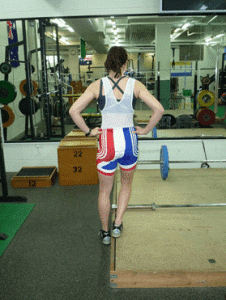 Strength training is not usually part of most amateur endurance athletes’ training programmes. However, there is an abundance of evidence that suggests it plays an important role in optimising running performance and reducing overuse injuries. It has been demonstrated many times that heavy strength training improves running economy and mitigates loss of stride length associated with fatigue when running at competition speeds. So if you want to run faster it’s important to include strength training as part of your training regime. At Star Physio Perth we can help by devising a tailored conditioning and strength programme that fits with your global training schedule in order to get you to the start line in the best condition possible and get you to finish line faster, without injuries. 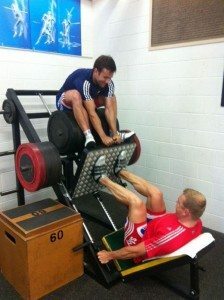 Sir Chris Hoy at the WAIS gym. 732kg! One of our Clinical Directors at Star Physio Perth, Dr Merv Travers, likes to ask his cyclist clients: “when was the last time that one of your training buddies said to you – ‘you know what your problem is on the bike? Your legs are too strong!’” Followed by “Do you think Sir Chris Hoy developed those pins just sitting on the bike?” When it comes to riding you can never be too strong in your legs. Much like running, research shows that adding strength training to traditional training regimens results in improved cycling economy and a reduction in overuse injuries. In fact, when it comes to turning the screw on your competitors (or just your mates) improved leg strength has been demonstrated to improve a five minute max effort at the tail end of a three hour ride (from an average of 371 Watts to an average of 400 Watts). 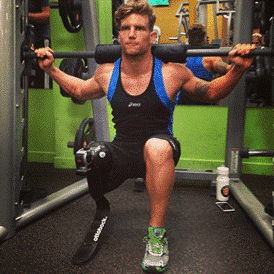 In other words, having stronger legs means getting to the finish line faster. In triathlon, improved cycling economy means getting off the bike sooner and with more spring left in the legs to attack the run. Many cyclists believe that they are doing strength training when they ride big gears up hills or in sprints. There is no question this sort of training has its place, but listen to Dr Merv’s response at a recent Triathlon WA lecture in the video below. If you want to ride faster, include conditioning and strength training as part of your training regime. At Star Physio Perth we can help by devising a tailored conditioning and strength programme that fits your individual training requirements. Therefore, if you want to ride faster include strength training as part of your training regime. At Star Physio we can help by devising a tailored strength programme that fits your individual training needs at either our fully equipped West Perth or Mosman Park Clinics. 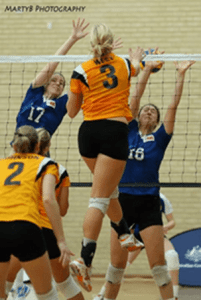 Star Physio Perth proudly works the Australian and WA Volleyball teams, and also with some of the state’s best athletes including state high jump champion Tom Brennan and of course our own ex-professional volleyballer, now physio Tara West. Jumping and power athletes have long understood how important strength and conditioning was in their programs to make them jump higher, but only more recently have we fully understood how important this strength was to prevent injuries, including overuse injuries, and rehabilitate jumping athletes with tendon pain and joint problems. If you are serious about getting bigger hops, and getting jumping pain under control or preventing it, come and talk to the team at Star Physio in Perth. From the overall assessment, we determine the starting point and develop a program to integrate with your other training, racing schedule and the other demands in your life. The absolute key to getting the most out of your programme and minimising the risk of injury and overuse injuries is the systematic planning of your training. This planning process is called “periodisation” and it involves the cycles of exercises, training loads and rest throughout the calendar so that you achieve your optimal performance on the day you need it (so you can peak on race day, not six weeks later)! You should never swim, bike or run by feel. That’s what your GPS, heart rate monitor, speedometer, power meter and all the fancy toys are for! Strength and conditioning training is no different. 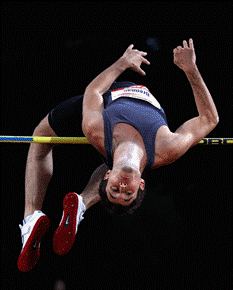 Self-programming and lifting by feel is a common error of many amateur athletes. It can lead to sub-optimal performance and injuries. Here at Star Physio Perth we design “data based programmes” that optimise the benefit for you and take the guess work out of gym training. Call our physios on 08 9212 4254 to start developing a training programme that’s right for you today. At Star Physio we have physiotherapists who are also qualified strength and conditioning coaches (Dr Merv Travers, Nigel Travers and Steve Jeffries) as well as physiotherapists who have double degrees in physiotherapy and exercise physiology (James Lewin and Dan Davies). Their combined knowledge base and skill set from physiotherapy and S&C disciplines allows them to test and identify your specific areas of weakness. Based on this screening, an individualised and targeted conditioning and strength programme can be created to address these potential sources of injury. Furthermore, they can coach you in the safe performance of the exercises and refine lifting technique putting you on the best possible track to reduce your injury risk and improve your performance. We also have a custom built gym/rehabilitation facility at our Mosman Park and West Perth clinics designed specifically for our clients’ needs. There, we teach the appropriate exercise repertoire for your needs and refine technique to maximise both the benefit and safety. 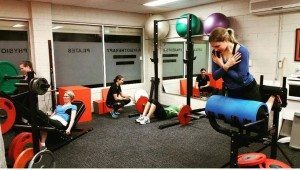 Many of our clients perform their rehabilitation on-site at the Mosman Park and West Perth clinics as we have specific rehabilitation tools that are hard to find in conventional gyms. Call us on 08 9212 4254 to find out more about our state-of-the-art facilities. Do you want to ride faster, be more efficient and reduce your risk of injuries on the bike? Then Cycle Fit and Tri Fit conditioning classes at Star Physio are what you have been looking for! Star Physio is excited to offer cycle specific conditioning sessions at our West Perth and Mosman Park clinics. Our physios have worked with some of the best cyclists and triathletes in the world and we offer our knowledge and experience in this area to everyone from the everyday enthusiast to the elite rider. We have long understood the relationship between strength and performance in endurance athletes, but only recently has the evidence emerged of the dramatic reduction in injuries in athletes by adding strength and conditioning work into a training program. Core strength and flexibility are also critical for maximising your cycling experience and we put all of this together in our 1 hour class. Our Cycle Fit and Tri Fit class incorporates specific lower limb strength exercises, as well as core conditioning and flexibility work as done by the best cyclists in the world. Correct technique is essential to getting the most out of your exercise, as well as minimising the risk of injury. We also want to know that you are otherwise in good shape so that you can get the most out of each session. For this reason we require you to come in for a screening and review as well as technique education session with our physio and strength and conditioning expert. Let us know if you have seen us recently and we may modify this just to a quick technique session if we know all about you already! We offer morning, afternoon and Saturday sessions but we are also happy to cater for a group (minimum 5 people) and book a session at a time convenient to you at the clinic of your choice. We also offer a number of women’s only classes. Give us a call on 08 9212 4254 and book in to change the way you ride today! Do you want to jump higher?